Envaya is translated into multiple languages, and you can use whichever language you feel most comfortable using. To change Envaya's language, click on the language menu at the top of any page on Envaya, and select a language from the list. You can also change Envaya's language by scrolling to the bottom of the page and clicking the name of a language at the bottom-left. 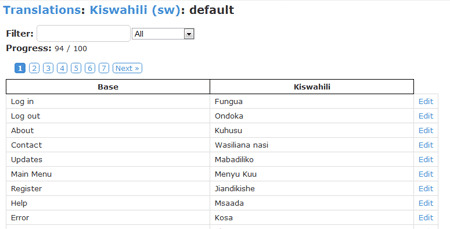 Organizations using Envaya may publish content in whichever language they prefer. 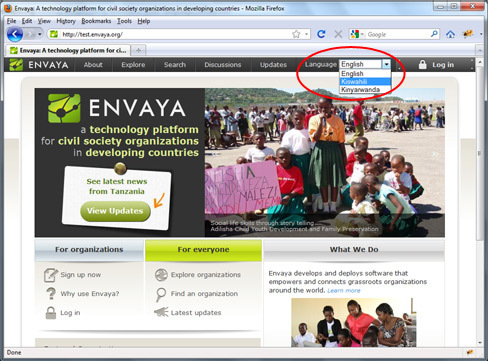 If you are viewing another organization's website on Envaya, their content is usually shown in their language, which may be different from the language you are using on Envaya. 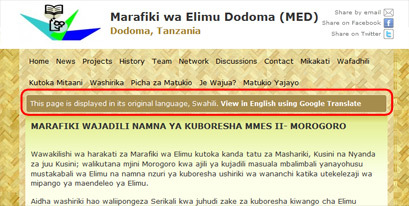 When viewing pages using Google Translate, an automatic computer translation service, translations may be incomplete or incorrect. Anyone is welcome to help improve Envaya's translations on Envaya's Translations site, http://envaya.org/tr . On the Translations site, you can correct any phrases on Envaya that are translated incorrectly. You can also add new translations, as well as vote and comment on existing translations. For instructions on how to contribute to Envaya's Translations site, visit http://envaya.org/tr/instructions .